Many articles can be read with the news announced by the firm of cupertino, so we will leave all those news that surely excite the followers of the mark aside to focus on what seems most relevant. 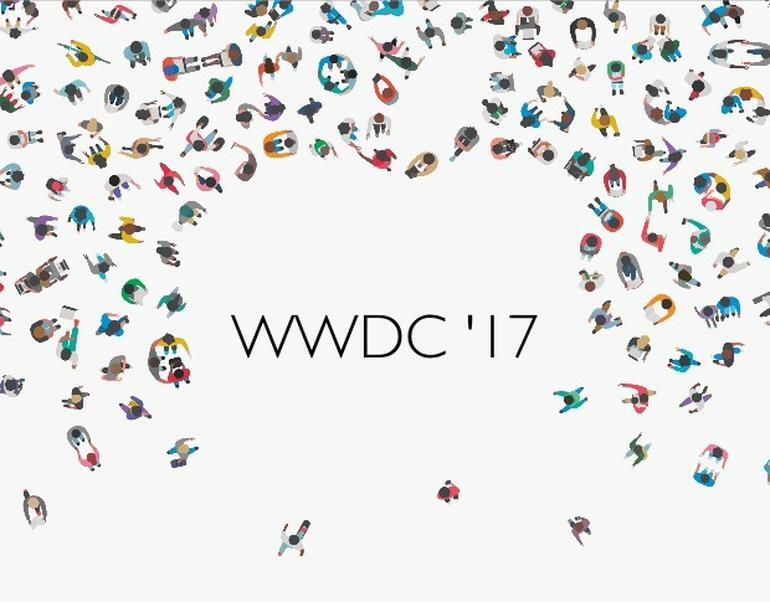 Apple confirms its interest in the VR and AR industry, and does not launch a new platform that further shreds the market. The absence of interest shown by Apple in VR has so far supported the idea of many skeptics who have taken these industries as passing fashions. Yesterday a year late than the PC, Apple announces VR-ready devices and enhancements on its software to deliver better graphics in this category. It is the definitive confirmation that these tools have come to change our world, leisure, social interaction and the way we will work. But if that seemed clear from the rumors, what is surprising is the strategy taken, contrary to that they have developed in many other products where they have redefined the concept independently of others. This time the announcement has not included any platform of its own, nor its own HMD. They have limited themselves to support other already existing and consolidated platforms starting with SteamVR, which means access for VIVE and OpenVR on Mac. Although this may disappoint some fans who may have expected an exclusive minimalist device of Apple's own, and this is great news. That an actor of this importance bet on one of the most consolidated platforms means much less fragmentation for the industry, therefore better access to content for users. This puts Apple for the first time an item like this in the majority consortium, rather than playing solo. Role that in this scenario has taken Facebook with Oculus. Still possible that the Apple will be preparing its own HMD, although they reserve to launch when the equipment this days announced announced are in the hands of early adopters. Probably if that, we will not see anything until 2018. On our side at Moøkan, we are excited about what we have seen. Apple makes its show with HTC and Unreal Engine, which are also our commitment to the future, with which we develop our virtual reality applications. This bronze on a granite base leaves the neck open and you can see the interior void of the piece. In the case of the 3d model we have only closed the gap without rebuilding all the interior due to the impossibility of photographing it and not wanting overload the 3D model with invisible geometry. Altogether we used 75 images to reconstruct this model of 10x20x30 cm creating a final version optimized for the browser 11882 polygons. To improve the quality of our models this time we have introduced some additional textures. 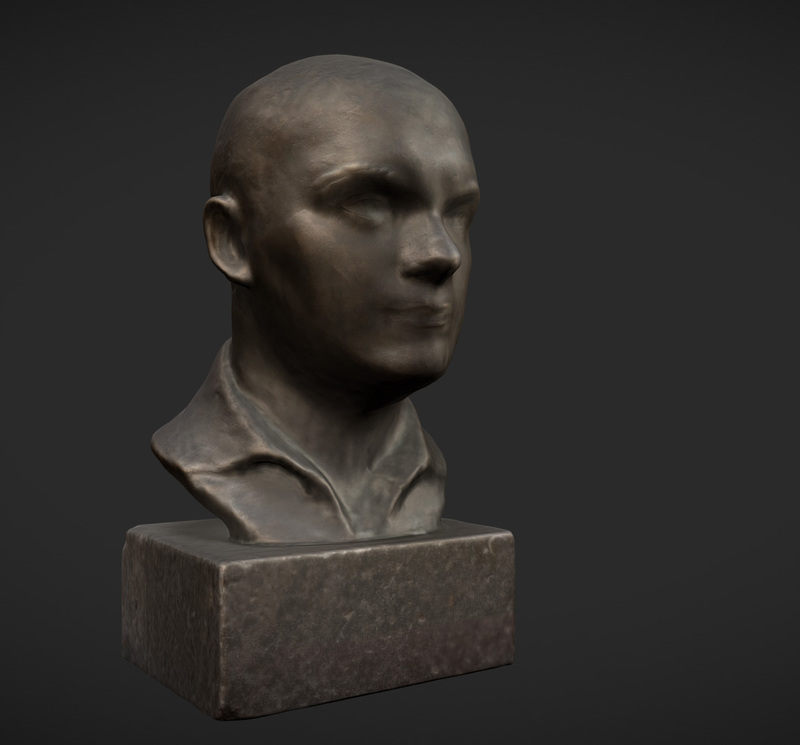 First we have separated the shadows of the sculpture itself, creating a texture for the color called albedo and another one for the diffuse shadows called Ambient Occlusion (AO). Subsequently, we have created the normal map and the elevation map. The two replace the information lost by reducing the model to view it in the browser. The normal map holds orientation information, which works very well with light. The elevation map using tessellations model allows us to recover the original geometry in applications like our Virtual Hall. Share this article if you liked it and do not forget to leave a comment! 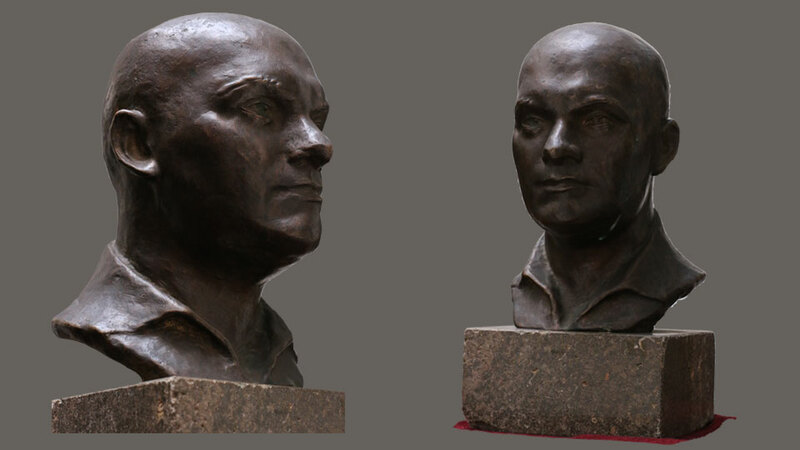 La escultura que hoy publicamos es un busto masculino de 1927, época que salía con Lorca. apenas 5 años después de ingresar en la Real academia de la Bellas Artes de San Fernando. Se trata de un yeso pintado de 48 cm de alto y 18 x 18 cm de base. Este modelo se ha reconstruido a partir de 43 imágenes del original. Gracias a la textura de la pintura, su poco brillo y la sencillez de modelo ha sido sencillo obtener un resultado muy preciso como se puede ver ahora en el modelo 3D. 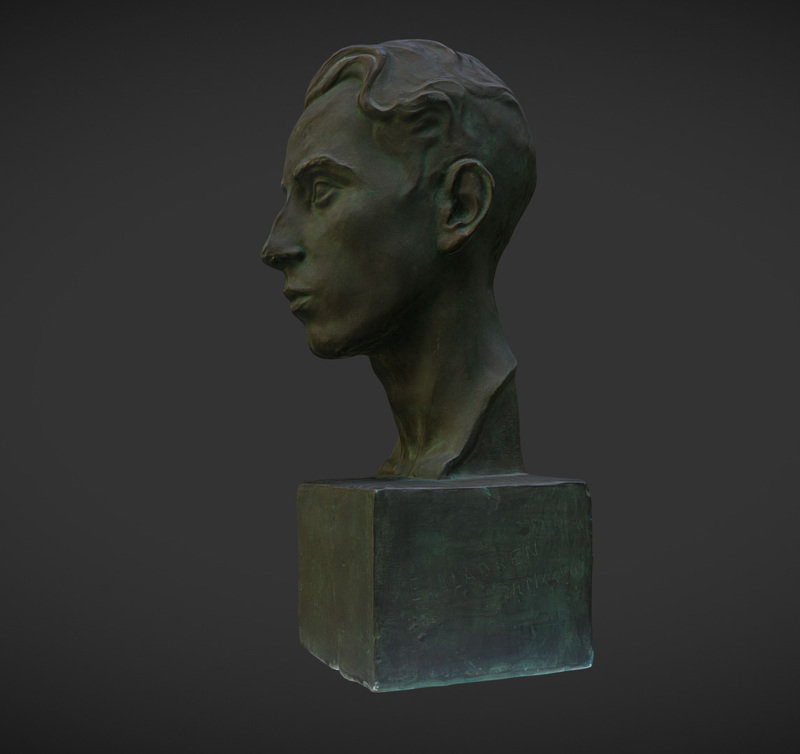 El modelo se puede descargar completamente gratis en su versión online desde Sketchfab, o comprar la versión detallada dándonos tu apoyo para continuar difundiendo arte y cultura en 3D desde Snaptank. En Moøkan creemos que esta es la forma en la que poder ver y disfrutar la escultura más allá de los museos y sin fronteras. Estamos deseando ayudarte a digitalizar tu colección ¡No dudes en contactarnos si deseas digitalizarla para su conservación o difusión! 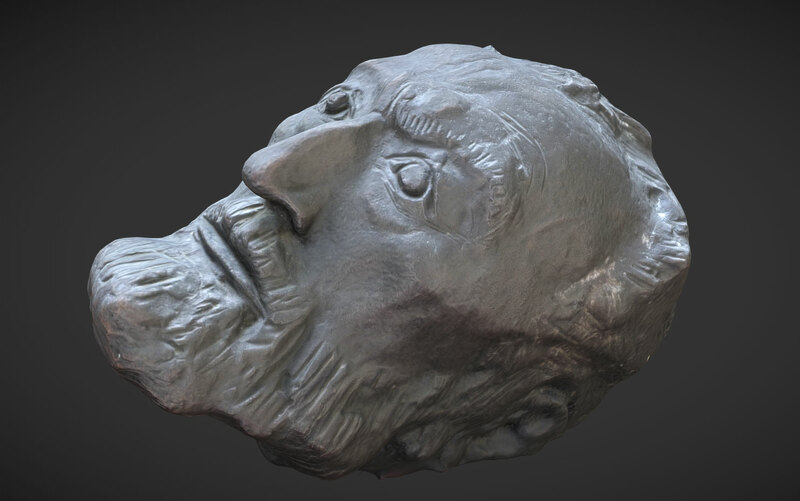 The digitized sculpture is a test for the head of the monument to Unamuno in Salamanca. 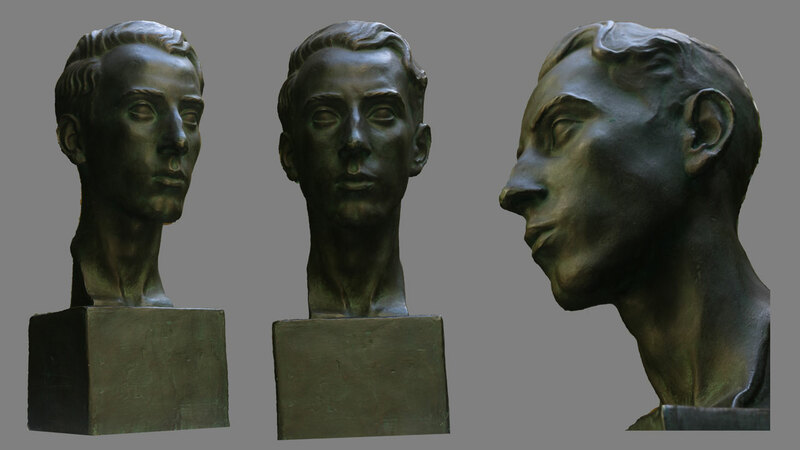 Sample of which was realized a series of 6 bronzes. 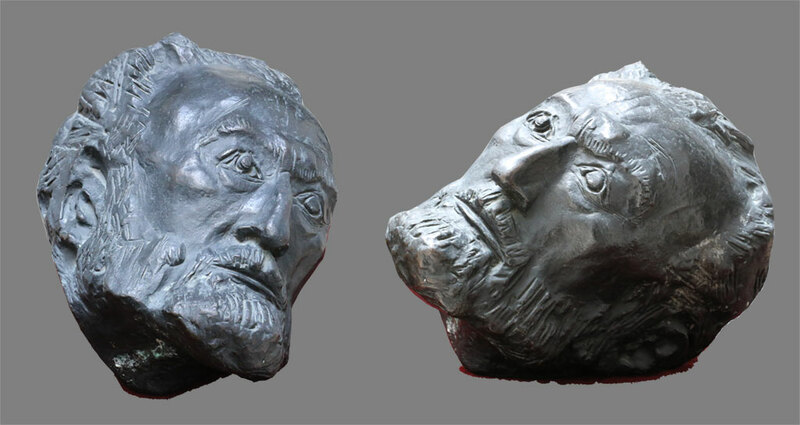 These pieces of similar size to the head of the monument in Salamanca have dimensions of 28.4 x 39 x 27.3 cm. The monument represents Miguel de Unamuno, philosopher and writer of the ‘98 generation (1898). Walking, pensive, with his hands behind his back, his body blurred and attention remained on his face, becoming the head the central theme of the portrait. To digitize it we have used 85 photos. We have built a high density 3D mesh of points that we have scaled and cleaned. Later we have optimized for viewing online, replacing the detail eliminated in this process by textures obtained by comparison between the detailed model and the simplified one. The final model goes from the original 9 million polygons to just 30,000, making it possible to see comfortably from the browser, phones, tablets and computers or virtual reality projects like our Virtual Hall. If you found interesting our post leave a comment and share it on social networks! And if you have pieces of art that you want to digitize for your private use or to publish do not hesitate to contact us. In Moøkan we look forward to help you! Download this model for free in Sketchfab or its high resolution version in Snaptank!